They are caused by limitations of the measuring device or the physical laws governing its behaviour. They are caused by the instrument not responding fast enough to follow the changes in measured variable. A practical example can be seen in a situation where the room thermometer does not show the correct temperature until several minutes after the temperature has reached a steady value. These may be due to causes which can not be readily established; could also be caused by random variations in the system under study. 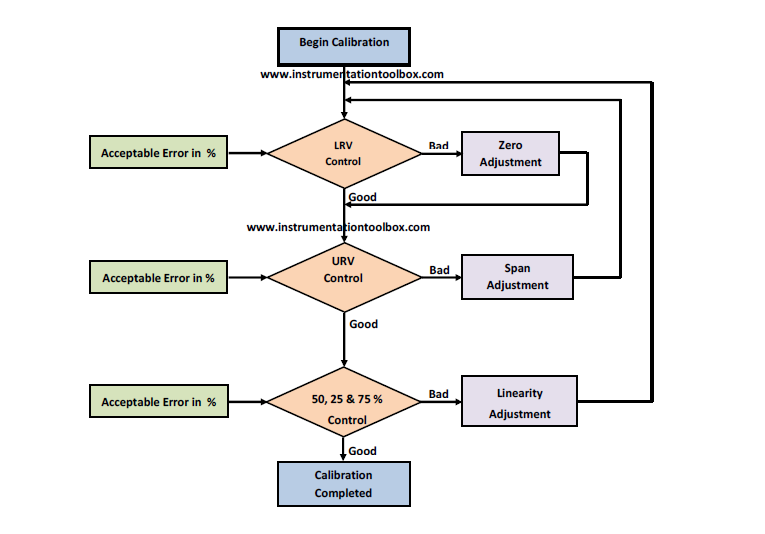 Calibration is a process where by we ascertain the output of an instrument after being used over a definite period, by measuring and comparing against a standard reference and to carry out the necessary adjustments required to confirm whether its present accuracy conforms to that specified by its manufacturer. (a) To collect measured values (Output values) of standard values(Input values) provided by a standard input reference. (c) To calculate the error on the output signal and to compare the result with the expected accuracy. If ERROR = EXPECTED ACCURACY, no adjustment is required. In other words we are verifying the accuracy of the instrument. In a five point calibration for an instrument, the output is measured at 0%, 25%, 50%, 75% & 100% of the calibration range of the instrument. In the five point calibration process, output readings are taken for upscale and down scale values of the calibration range to determine the repeatability and hysteresis of the instrument.